The card for your busy life style. Our Visa® Check Card gives you a faster, more economical, more convenient way to buy the products and services you need. It allows you to withdraw funds from your share draft account without ever having to write out a check. Purchase groceries, gas, or anything else! Use your card wherever the VISA® debit card is accepted. You can also use your card to withdraw, transfer or deposit funds at any STAR ATM machine. It’s like having your own personal teller whenever you need one. 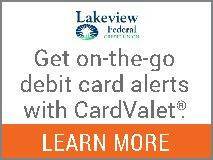 Equipped with the newest EMV Chip technology, A Visa™ Check Card at Lakeview is simple, smart and secure. We are a part of the Alliance One Network to give you access to more ATMs and less surcharges across the country. Look for the blue and white Alliance One Logo or follow the locator to find an Alliance One ATM nearby. Download the Alliance One App and get instant access to surcharge free ATMs.